Check your PM. I'm not going on about this publicly. Considering I just sent a PM to you, I'd say I'm not. What happens when you climb in a bed in Nether? In case that wasn't clear, apparently you have explosive nightmares. Wait, it blows up?? That's a tad inconvenient. 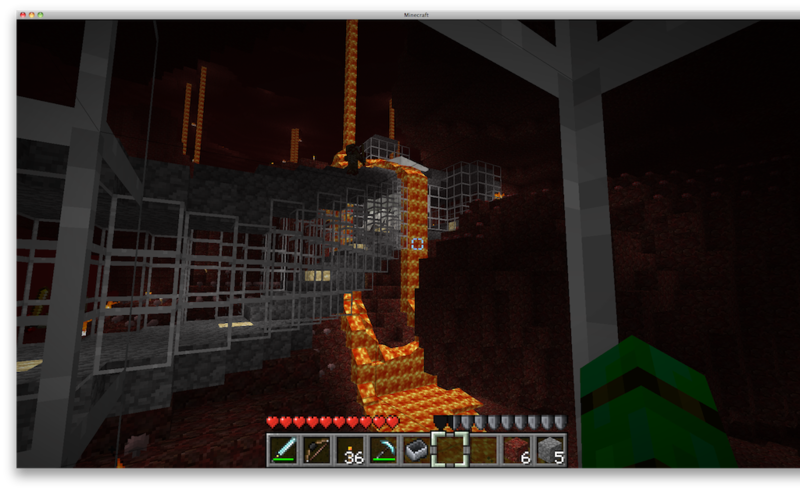 I plan to stay as far away from the Nether as possible. BTW, I logged in this afternoon and it put me outside my beach house in the middle of a storm.... freaked me OUT. I've had some login weirdness too. I logged out yesterday in Greys mushroom farm, and when I logged back in I was at the entrance to the surface greenhouse - ie: I was about 5-6 blocks higher than where I logged out. Weird, no? I've been doing a bit of land sculpting over at Barfing Skull Falls to join it to my warren of caverns and cover over any entrances with some natural landscaping. I was EXCITED to accidentally throw some bonemeal on the ground and see grass and flowers pop up!!! I was LESS THAN EXCITED to discover that you can no longer put torches on top of trees. What the heck?? Minor adventure tonight when I signed on! turtle called me to the nether to check out something spectacular: a ghast had spawned INSIDE Drew's portal room in the nether. You have to see it for yourself. 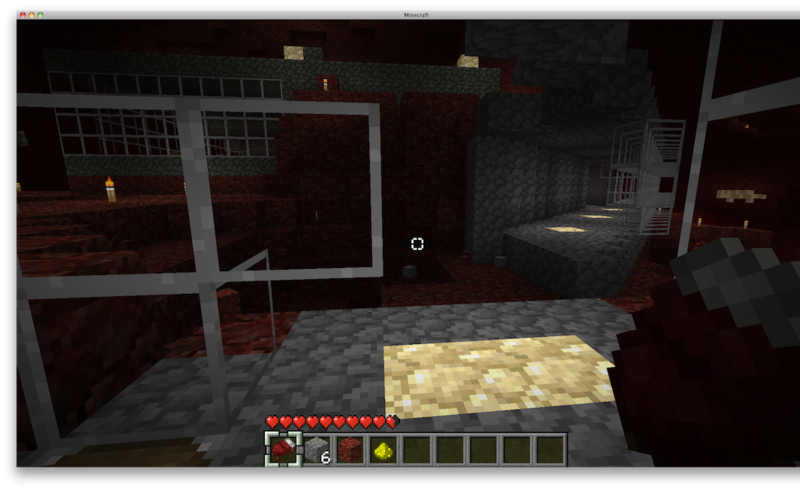 I guess we'll need to be more careful about room sizes in the nether. We'll work on shrinking this room to keep ghasts away. Yep, here's the screen cap of the visit I managed to get. FYI: I'm hiding under the bed right now. Pig man in a mine cart. Freaky. You need to get the official unofficial AppleNova texture pack! So the other day I was minding my business at home, when I mentioned how much fun the time we'd all gone CreeperMining and PRESTO!!! the next thing I knew I owned ALL THE DUCKEN and I kept them in MAH HOUSE. A bit of a mess, but only eggs to clean up. THEN, I go over to see this new gun thing that Bryson is building. It's pretty cool, but it did something VERY weird.... the TNT bullet went out toward a wall, then went STRAIGHT UP, then returned to horizontal travel, over some trees before blowing up. And they got some ducken, too. And then Brad blew me up several times. Adventure is afoot tonight. Where are RowdyScot and Robo when you need them? The adventure starts here. That's all I'm gonna say until you guys get here. So there was this ghast you see.... he was IN Spawn Portal. Yeah, so we had fun with it. Brad saved us. Thanks to him, we did some remodeling. Last edited by Bonn89 : 2011-07-02 at 13:46. I never knew I wanted a farm in my storage room until I had one there. It has been quiet lately. I'm only on with Brad here lately. I drop in every once in a while, but I'm usually the only one on then. Typically around 10-11pm PST is when I show up. im in right now. been a bit busy w/ some IRL land scaping. Yeah, I guess everyone's out doing Real World summer activities. Bah! At least the super awesome 1.8 adventure update should rejuvenate some interests in... oh, right... September. That's probably beta 1.7.3, which is the latest version. Go for it! I've been insanely busy this last week and only popped on for a couple of hours to work on the UFO. There's a lull this weekend that I plan on making some serious MC progress with.